SAN FRANCISCO, Ca. — This month Apple's Macworld Expo descended on San Francisco, California and students of Olivet Institute of Technology visited the Moscone Center for hands-on workshops and live interview sessions with a number of industry experts. A group of 10 students attended the event, taking place January 14-18. Aside from the new product announcements and executive keynotes, students particularly enjoyed professionally led classes on industry standard software. "This is a great experience," said sophomore OIT student Xianglai Kong. "We are able to converse with the latest technologies and get actual training from experts. Favorites included a two-day exercise with products that included Apple's Final Cut Studio, Aperture, and a special session exploring the Mac OS 10.5. "Being centered in San Francisco gives us tremendous opportunity to expand on student learning," commented OIT Director William Wong. "Macworld and other events of this scale also facilitate our work to leverage our position through meetings and partnerships with leading IT firms in the heart of Silicon Valley." 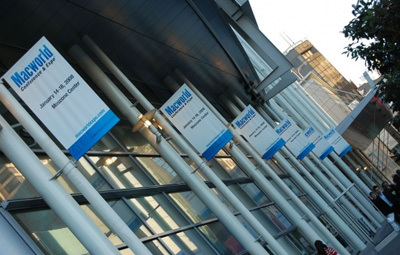 Macworld, the largest Macintosh event of its kind, presents over 400 exhibitors to an expected audience of more than 50,000 attendees in 2008.